The Oregon Ducks men’s basketball team will square off against Lorenzo Romar and the Washington Huskies tonight at Matthew Knight Arena. These two teams matched up nearly three weeks ago, but the Huskies (14-7, 3-6 Pac-12) will look a lot different this time around. Washington’s big man, Robert Upshaw, was dismissed from the program last week, due to a violation of team rules. Unfortunately, this wasn’t the first time that Upshaw had been dropped by a team. The 7-foot defensive specialist was also dismissed by Fresno State after his freshman season in 2013. Upshaw was the leader of Washington’s much improved defense, and at the time of his suspension, he was leading the nation in blocked shots. While there’s no question that the Huskies will miss Upshaw’s defensive presence, his absence will be a welcoming sight for the Ducks (15-7, 5-4 Pac-12). 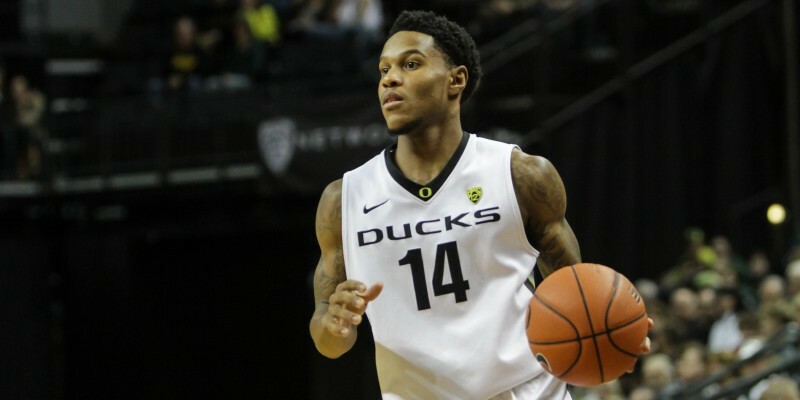 In the Huskies’ 85-77 victory over Oregon on January 18th, Upshaw’s performance on the defensive end devastated the highflying Ducks. He finished the night with 13 points, 12 rebounds and five blocks. The Ducks only shot 39% from the field in the second half of that game, and many of their looks were contested jump shots. “We didn’t do a very good job attacking last time. We took a lot of jump shots… we’ve got to do a better job of taking it to the basket, no doubt,” said Oregon head coach Dana Altman earlier this week. So what does Oregon have to do this time around if it expects to have success against an Upshaw-less Washington team? It’s simple: attack the basket. The Ducks attempted 30 three pointers when they played the Huskies in Seattle; they only made 11 of them. Despite the fact that Oregon has connected on 164 three pointers this season, which is second to Arizona State’s 168, heaving contested shots from three-point land is not exactly a recipe for success. Oregon must look to attack the basket tonight. The Huskies’ interior defense is not the same without Upshaw. Washington has given up 87 points per game since their big man was dismissed, while also allowing teams to shoot 56% from the field. Also, the Ducks must bring a defensive mentality tonight. If the Huskies replicate the offensive heroics that enabled them to score 85 points when these two teams first met, this game will be over very soon. The biggest key for the Ducks on the defensive end will be communication. Oregon gets burned when it doesn’t communicate, which leads to late rotations, poor pick and roll coverage, and wide open lanes to the basket. Since Upshaw’s dismissal, the Huskies have played at a much faster pace, which means that the Ducks’ transition defense will have to excel tonight. Lastly, Joseph Young only scored eight points and shot 3-12 from the field in Oregon’s early season loss to the Huskies. Young will have to show up tonight. He’s the motor of this basketball squad and the Ducks typically play well when he’s on his game. Also, the Ducks’ leading scorer is only 30 points shy of 2,000 career points. Young could become the fifth active NCAA basketball player to reach that milestone. If things go well for Young and the Ducks, it could possibly happen tonight.